Prevent chemical accidents in the lab with Thermo Scientific™ Nalgene™ Right-to-Understand Wash Bottles. 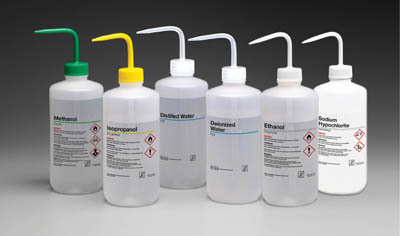 Bottles are labeled following the Globally Harmonized System (GHS). ALERT: Hand wash LDPE wash bottles with mild, non-abrasive detergent. Follow with a rinse in tap water and final rinse in distilled or deionized water. To avoid scratching the plastic or printing, do not use abrasive cleaners or scouring pads. Do NOT autoclave LDPE wash bottles. Warranty: Subject to Thermo Fisher Scientific standard limited warranty. See thermoscientific.com or your sales representative for details.